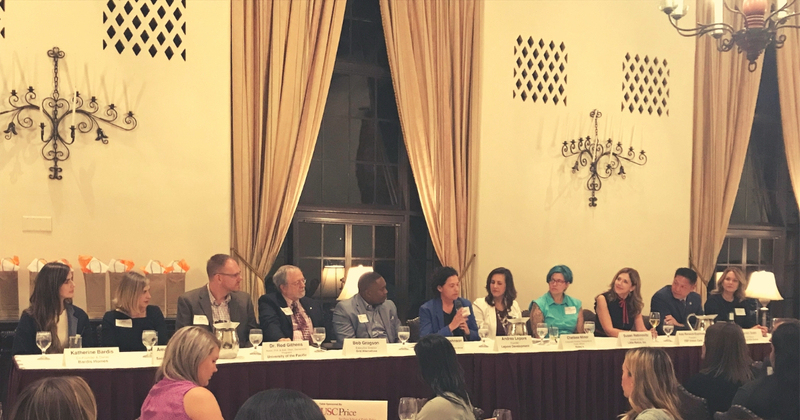 Executive Insight is one of Metro EDGE’s most popular networking events because it’s a valuable opportunity to connect with some of the top CEOs, presidents, and founders in the Sacramento region. Executive Insight was the first event I attended after becoming an EDGE member last year. I walked in armed with an empty notebook and a handful of business cards, but no idea what to expect. Executive Insight is one of the top networking opportunities that Metro EDGE plans each year, giving attendees the opportunity to gain advice from top local business leaders in an intimate round table setting. There is so much you can do to prepare before you even walk into Executive Insight. I highly suggest practicing your elevator pitch and setting goals for what you hope to get out of the event so you can leave ready to grow your own career. I looked up the panel speakers beforehand, but I didn’t really research them. Take advantage of having the opportunity to connect with a diverse group of professionals and do your homework beforehand. Knowing who I was speaking with and familiarizing myself with more than just their job title would have made it easier for me to connect. For example, Christopher Johnson, Founder and CEO of both Rapid Brands, Inc. and The Johnson Group was one of the panelists; little did I know that he also got his start on ABC’s Shark Tank! Looking back, I wish my blank notebook was full of thoughtful, innovative questions that would have helped me gain insight from the guests. I anticipated that I would be taking notes during the event and was not prepared when each speaker came to my table for an intimate conversation. I sat at my table quietly listening to other young professionals ask a variety of insightful questions, but I could have obtained more out of the experience if I spoke up and asked my own questions. These professionals are there to share their advice and experiences, so if a question pops into your head—ask it! I can see why Executive Insight is one of Metro EDGE’s most popular events, but I wish I did my homework ahead of time. I look forward to the upcoming event on April 16 and I plan to use what I learned last year to get the most out of the experience. This is a guest blog post by Rachael DiCicco, Communications committee member. Rachael is an Account Executive at FSB Core Strategies, specializing in public relations, public affairs, marketing and event production. She is originally from Southern California and now resides in Midtown Sacramento.